SPOP mutations in prostate cancer. Missense mutations in SPOP are the most common point mutations in prostate cancer, occurring in about 10-15% of primary disease. SPOP encodes the substrate-recognition component of a ubiquitin ligase, and SPOP mutations define a distinct molecular subclass of prostate. Tumors harboring SPOP mutations display characteristic genomic aberrations, gene expression profiles, and methylation patterns. We have observed SPOP mutations in both primary PCA and metastatic samples, indicating that the SPOP-mutant class of PCA remains relevant in advanced disease. Further study of SPOP mutations in PCA will lead to improved risk stratification and therapies for patients. One of the broad objectives of our research is to gain understanding of the biology of the SPOP-mutant class of prostate cancer by further defining the substrate specificity of mutant SPOP and the signaling pathways impacted, characterizing the spectrum of genetic alterations in these cancers, identifying potential pharmacologic modulators, and defining the biology of SPOP mutations in vivo. Defining novel subclasses of prostate cancer and underlying driver alterations. Prostate cancer is a clinically heterogeneous disease, with marked variability in patient outcomes. Emerging data (whole genome sequencing, whole exome sequencing, and transcriptome profiling) have revealed a striking degree of molecular heterogeneity as well, perhaps forming the underlying basis for this fundamental feature of the disease. Our group has identified distinct molecular classes of prostate cancer defined by characteristic genomic lesions, and we are currently working to define novel driver lesions that can improve our understanding of prostate cancer biology and therapy. Role of CHD1 deletion in prostate cancer progression. 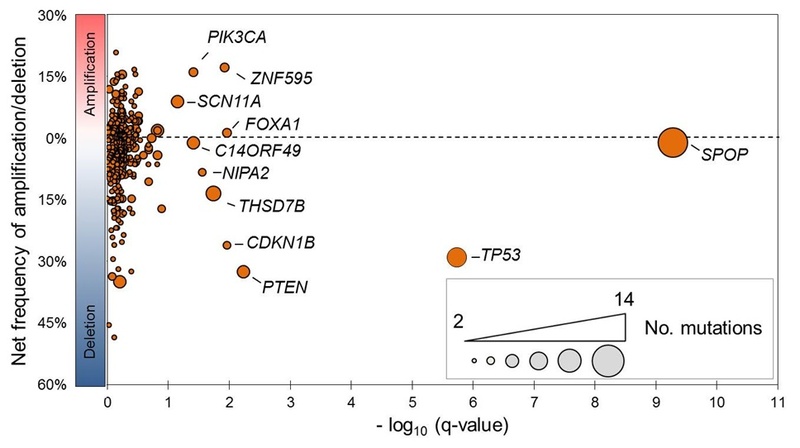 Prostate cancers harboring CHD1 loss display distinct patterns of point mutations, copy number aberrations, and genomic rearrangements, suggesting that loss of CHD1 is an important driver for a specific class of prostate cancer. Many questions about the role of CHD1 in prostate cancer and chromatin biology remain unanswered. 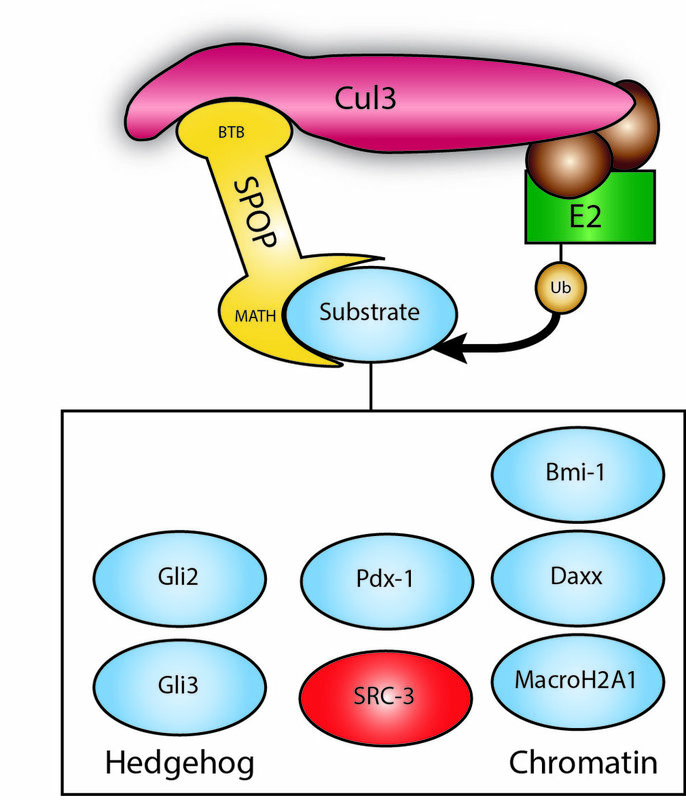 What are the specific mechanisms by which CHD1 regulates transcription in prostate cells, and how does this support a tumor suppressive function of CHD1? Alterations of nucleosome remodeling factors collectively are found in >20% of all human tumors, underscoring the critical role of chromatin biology in tumor suppression. However, CHD1 loss is largely restricted to prostate cancer rather than across all cancer types – what characteristic features of prostate tissue promote loss of CHD1 in tumorigenesis? Can CHD1 deletions serve as a model to understand the more widespread effects of dysregulated chromatin remodeling across all cancers? We have developed novel genetically mouse models, andare working in collaboration with labs at MSKCC, Rockefeller University, and WCMC to explore these questions. Our laboratory is focused on defining the impact of novel alterations and molecular subclasses for the care of patients with prostate cancer. Doing so will expose determinants of aggressive and indolent disease, and predict response to specific therapies. This work will allow physicians to make more informed choices about which patients need treatment for their cancer, and which treatments are best for each individual patient.